Summary: The Tripper should at least be enough to keep fans of The Burning and Sleepaway Camp satisfied. Ronald Reagan is a serial killer! Well, okay, it’s actually an axe-wielding maniac dressed in a Reagan mask who’s doing the slaughtering in The Tripper. But the sight of the killer dispatching his victims while dishing out quips in the manner of the former president is the main source of amusement in David Arquette’s directorial debut. Arquette plays his movie firmly for sick laughs rather than scares and, like Adam Green’s recent comedy-horror Hatchet, The Tripper is a colourful throwback to the heyday of 1980s slasher movies. In fact, considering the killer is dressed as Dutch rather than Dubya, you can’t help but wonder why Arquette didn’t go one step further and set the entire thing in the 80s. The serviceable storyline sees a bunch of stoned hippies head out to a rock festival deep in the Californian woodland. Before the festival’s even got going the kids have to contend with local rednecks and pesky cops – and then the slaughter starts in spectacularly gory fashion. This is no bleak, washed-out horror movie. The costumes, sets and, of course, the blood is never less than brightly coloured, and there’s the occasional Shrooms-style psychedelic flourish as the friends become increasingly wasted. There is also some amusingly deadpan dialogue (“But I’m a Republican!” one victim splutters), and Arquette injects the movie with a genuine sense of fun, making it hard to dislike. But unlike Adam Green, Arquette is far less adept at creating well-timed shocks, and forgets that laughs and scares serve to compliment each other in the best comedy-horrors. 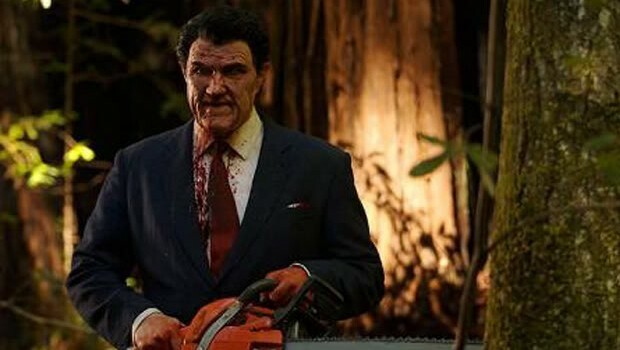 Setting many of the slaughter scenes to punk music (The Reagan Youth, natch) dissipates any real sense of tension, and you can’t help but wish that The Tripper would take itself just a little more seriously (the polar opposite to recent po-faced slasher All the Boys Love Mandy Lane). Still, the movie benefits from some fun performances, notably a pitch-perfect Thomas Jane as a well-meaning cop trying to maintain a sense of order amid the chaos, Richmond Arquette as his joint-puffing deputy and Paul ‘Pee Wee Herman’ Reubens as the foul-mouthed festival organiser. Watch out, too, for a fleeting cameo from Courteney Cox Arquette as one happy camper victim. Amid all this the likes of Jaimie King, Lukas Haas and Marsha Thompson make for likeable protagonists/victims – and a lineup of sympathetic victims is key to any good slasher movie. Add to this buckets and buckets of the red stuff and The Tripper should at least be enough to keep fans of The Burning and Sleepaway Camp satisfied. A reasonable set of cast and crew interviews, plus a trailer.